Background: Use of volatile anaesthetics (VA) has gained interest as an alternative to intravenous sedatives in ICU patients mainly because of their very short half-life. So the combination of sevoflurane with targeted temperature management might both improve quality of care and length of stay of out of hospital resuscitated (OHCA) patients. We studied the effects of a protocol change including sevoflurane on the duration of ventilation and ICU length of stay. The secondary endpoint was the incidence of delirium. Methods: We retrospectively compared two successive protocols in 128 OHCA survivors, admitted between January 2015 and April 2017. In the first period patients were intravenously sedated and deeply cooled (TTM/ IV) (n=77), and from 2016 onwards patients were sedated with sevoflurane and mildly cooled (mTTM/sevo) (n=51). Patients were compared protocol-wise. In normally distributed variables a Student T-test was used, otherwise non-parametric analyses (Mann-Whitney U) were used. Clinical endpoints were studied in patients with full neurologic recovery. Results: The duration of ventilation and ICU length of stay were both shorter in the mTTM/sevo group ((median 28.2 h, IQR 26.4-38.5) vs. median 90.1 h, IQR 59.1-159.2; p<0.01) and median 2.3 days (IQR 1.9-2.7) vs. 5.6 days (IQR 3.9-7.9); (p<0.01), respectively. Moreover, hospital length of stay was shorter in the mTTM/ sevo group, median of 8.9 days (IQR 5.4-16.9) vs. 15.8 days (IQR 11.7-23.3) in the TTM/IV-group (p<0.01). The incidence of delirium was higher in the TTM/IV group ((51.8%) vs. (11.5%) in the mTTM/sevo group; p<0.01). Conclusion: Sevoflurane combined with mTTM is a safe alternative in OHCA survivors. We demonstrated a shorter ventilator dependency, and both a shorter ICU and hospital length of stay. The lower delirium incidence in patients with full neurologic recovery is of particular interest and deserves further research. It is possibly associated to less benzodiazepine administration. Question: Does sevoflurane in combination with a mild cooling strategy shorten ICU length of stay and ventilator dependency when compared to intravenous sedatives and a deep cooling strategy in post-cardiac arrest survivors? Findings: Sevoflurane combined with a mild cooling strategy significantly reduce ventilator dependency, intensive care length of stay, incidence of delirium and hospital length of stay. Meaning: Sevoflurane and mild cooling are safe alternatives to intravenous sedatives and deep cooling post-cardiac arrest survivors. Our study confirms previous data on a reduction in ventilator dependency and ICU length of stay. We created new insights in this field of research by adding pre-hospital data and showed a reduction in hospital length of stay and a lower incidence of delirium. These effects add to quality of care in post-cardiac arrest survivors. Out of hospital cardiac arrest (OHCA) has a high mortality rate, even after return of spontaneous circulation (ROSC). Both direct and secondary neuronal damage account for this ; therefore, the primary aim in cardiac arrest (CA) survivors is preserving neurological function. Despite some recent landmark publications, there is an ongoing discussion regarding the best treatment for OHCA patients. While mild hypothermia between 32°C and 34°C was advised in earlier guidelines, no apparent benefit could be shown in a recent randomised trial when compared with a temperature of 36°C [2-4]. Sedation is important during the first hour and day in post-CA patients. It may prevent neuronal hyperactive excitation and deleterious oxygen consuming episodes such as shivering. Sedation also facilitates invasive mechanical ventilation and monitoring. Intravenous (IV) administration of sedatives such as midazolam and propofol is common practice in resuscitated patients despite several disadvantages. Depression of cardiac function and a suppression of respiratory drive, in combination with their often-prolonged time of action and causative association with delirium, make them less suitable for post-CA sedation. Volatile anaesthetics (VA) such as sevoflurane and isoflurane are a promising alternative to IV sedatives, due to their very short halflife. Although VA has cardiac depressant effects, several studies suggest positive pre- and post-conditioning effects [5-12]. Though routine use of VA in the ICU is still uncommon and the literature on sedation with VA is scarce, recent publications have shown promising results [13,14]. The anaesthetic conserving device (AnaConDa®, Sedana Medical, Uppsala, Sweden) enables easy administration of a low dose VA without the need for specialized and expensive equipment. Due to the publication of Nielsen et al. we decided to treat our patients according to their modified temperature management protocol. At the same time we introduced sevoflurane, as we hypothesized that resuscitated patients who proved to have little or no neurologic damage, could be extubated early, so the need for ICU resources could be reduced significantly. All patients diagnosed with non-traumatic OHCA admitted between January 2015 and April 2017 were retrospectively screened. Relevant data on prehospital life sustaining measures could be retrieved from the electronic hospital information system and the emergency medical service database from January 2015 onwards. Our Institutional Review Board waived the necessity for informed consent, since this study was retrospective in design. Primary endpoints were duration of ventilation, ICU length of stay and hospital length of stay in ICU survivors. Secondary endpoints were quality of sedation, use of opioids, vasopressor need and incidence of delirium. For comparing our primary study endpoints, we selected and compared the subgroup of patients who were discharged from the ICU alive with a Glasgow Coma Scale (GCS) ≥13. The reason for this selection was that in case no or little neurologic damage occurred after ROSC and during the treatment period thereafter, patients could awake as soon as sedation has been withdrawn. Obviously, this patient group could not be indicated in advance, so a comparison of these groups in a retrospective study was chosen. We excluded patients <18 years of age and all in-hospital cardiac arrest (IHCA) patients, since comorbidity is substantially different when compared to OHCA patients. Patients who remained comatose after sedation was stopped, underwent somatosensory-evoked potentials (SSEP) and/or a computed tomography (CT)/magnetic resonance imaging (MRI)-scan for neurological prognostication. In case a SSEP was performed and the short latency N20 signal (negative response at 20 ms after stimulation) was found negative on both sides, all therapy was withdrawn as this is considered a reliable predictor of futile outcome. During the first period, between January 2015 and June 2016, all patients with a Glasgow Coma Scale (GCS) score ≤6 at ICU arrival were treated according to a standard targeted temperature management protocol with a temperature target set between 32°C and 34°C in combination with IV sedation (TTM/IV-group). If appropriate, patients were cooled with a maximum of 2 LIV 4°C normal saline 0.9% immediately after arrival at the ICU. Additionally, a cooling blanket (Cure Wrap, MTRE, Israel) could be used. Hypothermia was continued for a period of 24 hours after reaching the first point of a temperature ≤34°C. Rocuronium was used intermittently to prevent or treat shivering. Patients were sedated by any combination of midazolam, propofol, dexmedetomidine and fentanyl at the discretion of the treating physician, with midazolam being our standard sedative. All temperatures were measured centrally using a bladder probe. After 24 hours, cooling was stopped and patients were rewarmed passively. Sedation and analgesia were concomitantly diminished with increasing temperatures and withdrawn after reaching a temperature of at least 36°C. Re-cooling was started whenever necessary to keep temperatures below 38°C. A GCS of ≥12 was a requisite for extubation. In June 2016, a new standard of care was introduced into our ICU for post-CA patients. A modified targeted temperature management protocol was implemented, with a temperature target set at 36°C for 24 hours and below 37.5°C in the 48 hours thereafter. Patients were sedated by continuous inhalation of a low dose of sevoflurane (AbbVie, USA) combined with a reduced dose of IV fentanyl (mTTM/sevo-group). Sevoflurane was administered with the AnaConDa® into the breathing circuit (Maquet servo-I, Germany). FlurAbsorb® canisters were used on the expiration port to scavenge waste anaesthetics. No intravenous sedatives were allowed during the period in which sevoflurane was used. Continuous measurement of the end tidal CO2 and sevoflurane concentration (Vamos, Dräger, Germany or Intellivue G7m, Philips, The Netherlands) was performed. End tidal sevoflurane concentration was targeted between 0.8-1.5% (0.3–0.6 MAC). Whenever possible, all patients in the mTTM/ sevo-group protocol were monitored with a continuous electroencephalogram (EEG) during the 24 hours after ICU arrival. In both treatment groups, the targeted Richmond Agitation Sedation Scale (RASS) was -4 to -5. Patients were assessed by a nurse at least once every shift, for the presence of delirium by using the Confusion Assessment Method in the Intensive Care Unit (CAM-ICU). In all patients, a mean arterial pressure of >70 mmHg was pursued. IV fluids or norepinephrine could be used on the physician's discretion. All patients were compared protocol-wise (TTM/IVgroup versus mTTM/sevo group) for both primary and the secondary endpoints. If variables had a normal distribution, a Student T-test was used to compare between the two protocol-groups and data are reported as means ± confidence interval (CI). Otherwise, non-parametric analyses (Mann- Whitney U) were used and medians are reported ± interquartile range (IQR). Smaller sample sizes were analysed using the Fisher's exact test. All analyses were performed with IBM SPSS statistics version 24. Between January 2015 and June 2017, 128 OHCA patients were admitted to our ICU and treated according to our TTM/IV or mTTM/sevo protocol in 77 and 51 cases, respectively (Figure 1). 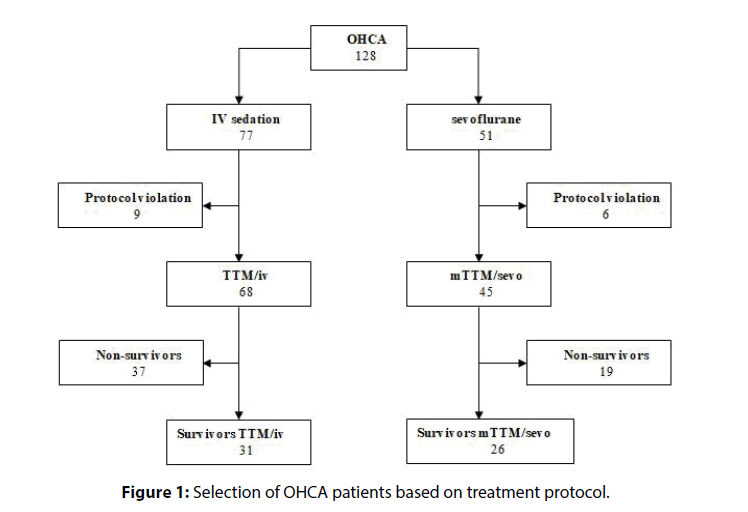 Figure 1: Selection of OHCA patients based on treatment protocol. All patients were intubated (pre-hospital or in the emergency department) and sent to the ICU regardless of whether a percutaneous coronary angiography was performed. Nine patients from the TTM/IV-group were excluded from analyses: 2 patients had a GCS ≥12 and 7 patients had cooling protocol violations. Thirty-one patients survived (45.6%) in this group, with a maximal GCS of 15. Six patients from the mTTM/sevo group were excluded: 2 did not complete our 24-hour sedation protocol with sevoflurane alone (concomitant sedation with IV drugs), 1 patient suffered from a traumatic CA (C-spine fracture) and 3 patients were cooled according to our previous TTM/IV protocol. Twenty-six patients in this group were discharged from the ICU alive, with a maximal GCS of 15 (57.8%). Time to the start of advanced life support (ALS) did not differ significantly between both groups. In the TTM/IV group, in 38.7% of patients ALS was started within 6 minutes, compared to 31.8% in the mTTM/ sevo group (p=0.61) (Table 1). n (%) 24 (77.4) 0 (0) n.a. Table 1: Characteristics of patients discharged alive from ICU after OHCA (x)=time from emergency call to arrival of ambulance; ‡)number of patients that have RASS -4 or -5 at all measured time points; (t=1, t=6, t=18, t=24); n.a: not applicable; Two patients in the TTM/IV group have missing values; *: median dose determined only for patients who received the sedative). No significant differences were found in the median time to ROSC, i.e. the difference between the time points of emergency call and departure of the ambulance to the hospital (mTTM/sevo 27 minutes vs. TTM/IV 24 minutes, p=0.26). Duration of ventilation was significantly shorter in the mTTM/sevo group (median 28.2 h, IQR 26.4-38.5) compared to the IV group (median 90.1 h, IQR 59.1-159.2; p<0.01). After extubation, patients from the mTTM/sevo group were discharged significantly earlier from the ICU (25.7 h, IQR 18.9-30.1) compared to TTM/IV group (31.6 h, IQR 25.0-55.6; p=0.02). Moreover, total length of the ICU stay was significantly shorter in the mTTM/sevo group with a median of 2.3 days (IQR 1.9-2.7) versus a median of 5.6 days (IQR 3.9-7.9) in the TTM/IV group (p<0.01). Also, total hospital length of stay was significantly reduced in the mTTM/sevo group, showing a median of 8.9 days (IQR 5.4-16.9) versus 15.8 days (IQR 11.7-23.3) in the TTM/IV-group (p<0.01). A lower incidence of delirium, as diagnosed with the CAM-ICU, was observed in the mTTM/sevo group 3 patients (11.5%) versus 16 (51.6%) in the TTM/IV group (p<0.01) (Table 2). Total, n (%) 16 (51.6) 15 (48.4) n.a. Before extubation, n (%) 9 (29.0) 22 (71.0) n.a. After extubation, n (%) 7 (22.6) - n.a. Table 2: Incidence of delirium and influence on discharge times in the TTM/IV group (*) Time to extubation was compared between patients with and without a positive CAM-ICU before extubation; n.a. : not applicable). In 9 cases (29%) in the TTM/IV group, delirium was diagnosed prior to extubation, 7 cases (22.6%) were diagnosed after extubation. The median time to extubation in patients with a delirium in the TTM/ IV group was 194.0 hours (IQR 97.5–349.0) vs. 72.0 hours (56.3–97.8) in the same group, without a delirium before extubation (p<0.01). Median time to discharge from the ICU in patients who developed a delirium was 173.2 hours (IQR 106.9–272.2) vs. 113.9 hours (IQR 82.9–144.7) in patients without a delirium (p<0.06). All three patients with a delirium in the mTTM/sevo group were diagnosed after extubation. The quality of sedation with sevoflurane revealed to be superior compared to IV sedation as RASS was equal or lower than -4 in all sevoflurane treated patients anytime. A substantial part of the IV group was treated with a combination of midazolam plus propofol and/or dexmedetomidine (n=24, 77.4%), while no additional IV sedatives were allowed in the mTTM/sevo group. In the TTM/IV group, median cumulative dose was 440 mg (IQR 361-535) for midazolam, 3578 mg (IQR 2626-5760) for propofol and 485 μg (234) for dexmedetomidine. Patients from the mTTM/sevo group needed significantly less concomitant fentanyl to obtain an appropriate level of sedation with a median cumulative dose of 1725 μg (IQR 1238-2284) versus a median of 4645 μg fentanyl (IQR 3580-5910) in the TTM/IV group (p<0.01). As a surrogate for hemodynamic stability we measured the maximum dose of norepinephrine. There is a significant difference in vasopressor need in the mTTM/sevo group (IV group 0.08 μg/kg/min, IQR 0.02-0.15 vs. 0.18, IQR 0.09-0.34; p≤0.01). In this retrospective study, we compared two different treatment strategies in OHCA survivors. We found that the duration of mechanical ventilation, length of ICU stay and length of hospital stay were significantly shorter in patients treated with mTTM/sevo compared to patients treated with hypothermia and IV sedatives. One major explanation for this difference is the time taken to cool patients to their target temperature in sum with the time to normalize temperature in the patients treated with hypothermia. In general, a rise of body temperature could vary from 0.2-0.5 degree per hour. In the paper from the Cardiac Arrest Study Group it took 6 hours to cool and 24 hours to rewarm the patient . In the Nielsen study, temperature management took at least 36 hours, resulting in a significantly longer duration of mechanical ventilation, but not length of ICU or hospital stay . Our findings are consistent with other data. This was also confirmed in the study of Lybeck who found significantly longer wake-up times in more deeply cooled patients. Shorter acting sedatives like propofol and remifentanil may shorten the wake-up time compared with intravenously used midazolam. However this was not confirmed in the study of Staudacher who compared the VA isoflurane with propofol sedation [15,16]. This could partially be explained by the fact that almost all patients in both regimens were deeply cooled. Recently, Krannich et al. have shown the beneficial effect of isoflurane in OHCA patients in an ICU setting. The investigators found a significant reduction in the duration of mechanical ventilation and ICU length of stay, but not hospital length of stay. Their analyses extended to all OHCA patients and were not limited to survivors only . Hellström et al. described shorter wake-up times after prolonged sedation with sevoflurane in post cardiac surgery patients compared to propofol . Another contributing factor to shorter wake up times could be the opioid sparing regimen in the TTM/sevo group. The presence of delirium in patients receiving intravenous sedation is an important factor in the decision to extubate patients, as prolonged use of benzodiazepines is a well-known risk factor in the development of delirium. Moreover, combinations of intravenous sedatives may have additive effects. This may explain, at least in some part, the longer ventilation times and ICU-length of stay. A finding of particular interest is, that none of the patients receiving sevoflurane, woke up with a delirium and quick extubation was not withheld after emergence. Only three patients developed a delirium after extubation in this group. None of these patients needed to be reintubated. Remarkably, we found a significantly longer length of ICU stay after extubation in the TTM/IV group. This could not be explained by the longer time taken to wake up. A substantial group who received intravenous sedatives, developed delirium after extubation. This may have contributed to the longer ICU length of stay. In our opinion, a prospective trial comparing sevoflurane with an alternative ultra-short working sedative regimen, such as the combination of propofol and remifentanil, in OHCA with modified temperature management is needed. Maximum norepinephrine dose was higher in the mTTM/sevoflurane group. It is possible that sevoflurane induced more hypotension but administration of cold saline in the TTM/IV group may have resulted in a more favorable volume status, which lessens the need for inotropic support. In patients with a potentially good neurological recovery, a rapid and reliable clinical examination is of paramount importance. We demonstrated that 50% of patients could be extubated with a maximal GCS within 28 hours after hospital arrival when sedated with sevoflurane, and that IV sedation delayed extubation with a median of 91 h. Delirium, possibly induced by high doses of intravenous sedatives, might have contributed to this delay. In general, an a priori uncertain neurological outcome significantly delayed extubation in both treatment groups and extended diagnostics with EEG or SSEP should be at help. Several points need to be considered when using the AnaConDa® and VAs. Hypercapnia may occur and may necessitate for ventilator adjustments. This occurs because the AnaConDa® increases the physical dead space by approximately 100 ml. Potentially, the dead space can increase further due to reflection of CO2 in the AnaConDa® . In this study, we did not compare the ventilator settings and capnography; however, hypercapnia was not a substantial problem in any of our patients. Ventilator setting can easily be adapted to maintain normal levels of CO2. Both sevoflurane and isoflurane can be administered with the AnaConDa®. Isoflurane seems to be the drug of choice in other European countries, while sevoflurane is mainly used in the Netherlands. We believe that sevoflurane has advantages over isoflurane. Since it has a lower blood-gas partition coefficient than isoflurane it causes even faster induction and emergence. Though less relevant in an ICU-setting, sevoflurane has no pungent effect on the upper airways, therefore may be a better choice. This study has several limitations. Our study is retrospective and this may have led to confounding factors. We tried to correct for this by categorizing the time interval of circulatory arrest and time to ROSC in both groups. Both study groups were comparable, but a small sample size may influence primary and secondary outcome measures. Since we compared sevoflurane and mTTM at the same time, differences in outcome in length of stay and/ or duration of ventilation may be influenced by both the sedation regime and the TTM-protocol. Although a higher temperature target may theoretically lead to a reduction in ventilator dependency, we think this effect is exceeded by the use of sevoflurane. A combination of sevoflurane and a lower temperature target may well have led to a longer ventilator dependency, but will still significantly differ from IV sedation to the benefit of sevoflurane. Intravenous sedation seems to induce delirium more often . Sevoflurane can be used safely in an ICU setting and resembles an almost ideal sedative. Our study shows a reduction in ventilator dependency and ICU length of stay, especially in resuscitated patients with a favorable neurological prognosis. We created new insights in this field of research by adding pre-hospital data and showed a reduction in hospital length of stay. Furthermore, we were able to demonstrate a reduction in delirium incidence. When confirmed in other studies these effects add to quality of care in post-cardiac arrest survivors. The Board of Directors of VieCuri Medical Center and the local review board have no objection to the design and execution of this investigation. Nakashima R, Hifumi T, Kawakita K, et al. Critical care management focused on optimizing brain function after cardiac arrest. Circ J. 81: 427-39 (2017). Safar PJ, KochanekPM. Hypothermia after cardiac arrest studying. mild therapeutic hypothermia to improve the neurologic outcome after cardiac arrest. N Engl J Med. 346: 549-56 (2002). Nielsen N, Wetterslev J, Cronberg T, et al. Targeted temperature management at 33 degrees C versus 36 degrees C after cardiac arrest. N Engl J Med. 369: 2197-206 (2013). Jerath A, Parotto M, Wasowicz M, et al. Volatile Anesthetics. Is a New Player Emerging in Critical Care Sedation? Am J RespirCrit Care Med. 193: 1202-12 (2016). Meybohm P, Gruenewald M, Albrecht M, et al. Pharmacological postconditioning with sevoflurane after cardiopulmonary resuscitation reduces myocardial dysfunction. Crit Care. 15: 41 (2011). Lemoine S, Tritapepe L, Hanouz JL, et al. The mechanisms of cardio-protective effects of desflurane and sevoflurane at the time of reperfusion: anaesthetic post-conditioning potentially translatable to humans? Br J Anaesth. 116: 456-75 (2016). De Hert SG. The concept of anaesthetic-induced cardioprotection: clinical relevance. Best Pract Res ClinAnaesthesiol. 19: 445-59 (2005). Zangrillo A, Musu M, Greco T, et al. Additive effect on survival of anaesthetic cardiac protection and remote ischemic preconditioning in cardiac surgery: a bayesian network meta-analysis of randomized trials. PLoS One. 10: e0134264 (2015). Guerrero-Orriach JL, Escalona Belmonte JJ, Ramirez Fernandez A, et al. Cardioprotection with halogenated gases: how does it occur? Drug Des DevelTher. 11: 837-49 (2017). Matchett GA, Allard MW, Martin RD, et al. Neuroprotective effect of volatile anesthetic agents: molecular mechanisms.Neurol Res. 31: 128-34 (2009). Riess ML, Matsuura TR, Bartos JA, et al. Anaesthetic post conditioning at the Initiation of CPR improves myocardial and mitochondrial function in a pig model of prolonged untreated ventricular fibrillation. Resuscitation. 85: 1745-51 (2014). Hellström J ÖA, Martling CR, Sackey PV. Inhaled isoflurane sedation during therapeutic hypothermia after cardiac arrest: a case series. Crit Care Med. 42: e161-6 (2014). Bellgardt M, Bomberg H, Herzog-Niescery J, et al. Survival after long-term isoflurane sedation as opposed to intravenous sedation in critically ill surgical patients: Retrospective analysis. Eur J Anaesthesiol. 33: 6-13 (2016). Staudacher DL, Hamilton SK, Duerschmied D, et al. Isoflurane or propofol sedation in patients with targeted temperature management after cardiopulmonary resuscitation: a single center study. J Crit Care. 45: 40-4 (2018). Lybeck A, Cronberg T, Aneman A, et al. Time to awakening after cardiac arrest and the association with target temperature management. Resuscitation. 126: 166-71 (2018). Krannich A, Leithner C, Engels M, et al. Isoflurane sedation on the icu in cardiac arrest patients treated with targeted temperature management: an observational propensity-matched study. Crit Care Med. 45: e384-90 (2017). Hellstrom J, Owall A, Sackey PV. Wake-up times following sedation with sevoflurane versus propofol after cardiac surgery. ScandCardiovasc J. 46 (5): 262-8 (2012). Sturesson LW, Bodelsson M, Johansson A, et al. Apparent dead space with the anesthetic conserving device, AnaConDa (R): a clinical and laboratory investigation. AnesthAnalg. 117: 1319-24 (2013). Jerath A, Panckhurst J, Parotto M, et al. Safety and efficacy of volatile anesthetic agents compared with standard intravenous midazolam/propofol sedation in ventilated critical care patients: a meta-analysis and systematic review of prospective trials. AnesthAnalg.124: 1190-9 (2017).